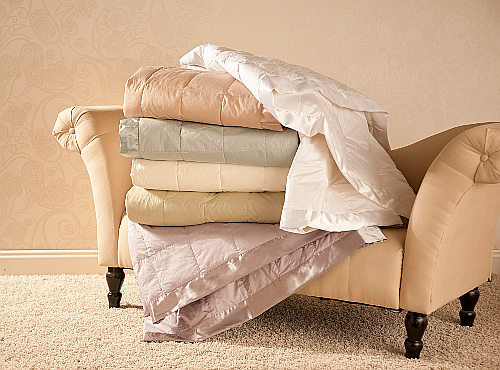 If you love down comforters, you’re sure to love this white goose down blanket from DownRight. Incredibly soft, this box stitched blanket is covered with a 330 thread count, 100 % cotton sateen and beautifully finished with a 3” coordinating satin trim. It’s filled with premium 600 fill power white goose down and available in colors sand, sea glass, mulberry, ivory, sage brush. Two brand new colors were recently added to the line, a crisp white and a beautiful creme. 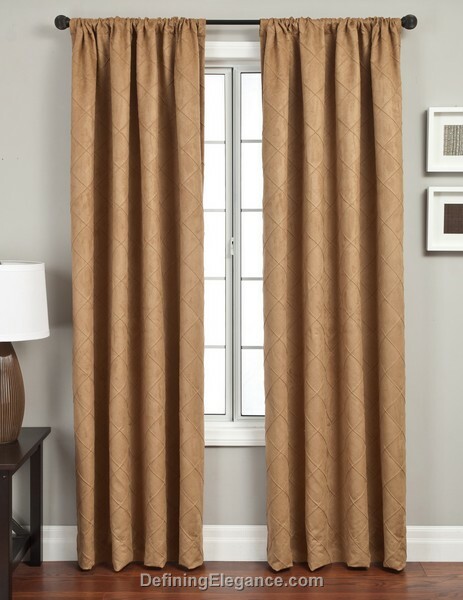 DefiningElegance.com offers a varied selection of Softline Home Fashions drapery panels. The Salvino collection is an ultrasuede that is available in seven colors. The soft and textured fabric will bring warmth to any room. As with most Softline drapery collections, the Salvino is available in 4 standard lengths and with options such as back taps, grommets, and scarf valance. 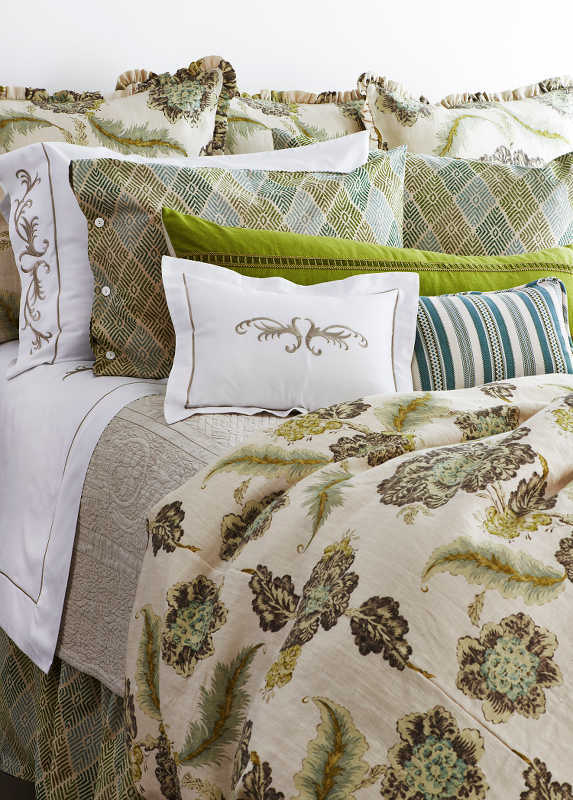 The Peacock Alley Baroque bedding collection’s timeless tapestry print is offered in two colorways: Gold and Linen. Choose the Gold collection (shown above) paired with a textured matelasse coverlet and ginger colored linen shams for a warm and cozy retreat. For a soothing spa-like escape, the Linen collection offers a quiet luxury. The duvet cover contains a hidden L-shape closure. Made in the USA. 55% linen/45% rayon. Machine washable. 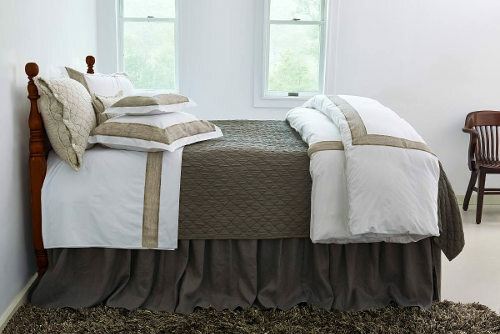 Traditions Linens Teara is a 320 thread count cotton sateen with exquisite scroll embroidery. These clean crisp white sheets are beautiful enough to stand on their own, paired with a textured coverlet and shams, or included as part of a bedding ensemble from other Traditions Linens collections for maximum impact. Teara includes duvet cover, pillow sham, coverlet, and sheet set. 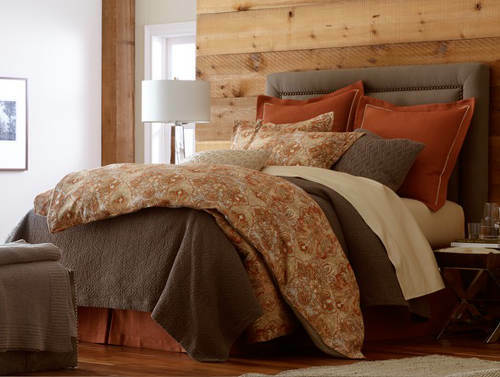 The Traditions Linens Lucerne bedding collection is our ode to all things alpine inspired. A cool combination of icy greens and blue is uniquely styled with a mix of patterns and textures for the ultimate luxe experience. This ensemble includes duvet cover, pillow shams, coverlet, sheet set, decorative pillow, and bed skirt. 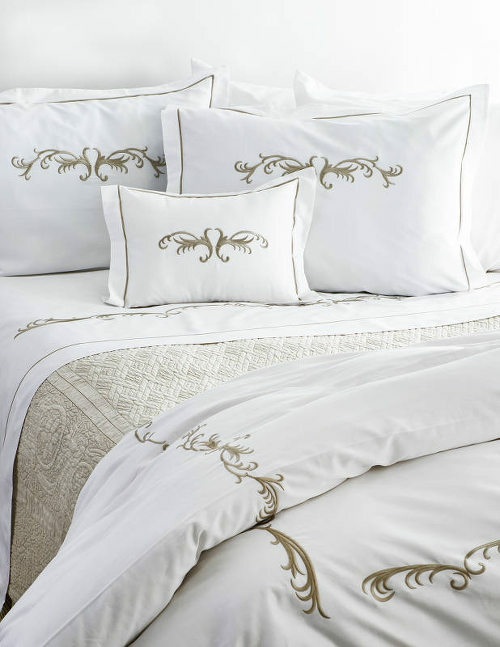 The sheet set is a 320 thread count cotton sateen with exquisite scroll embroidery. It’s easy to see why the Soprano sheet from Peacock Alley is a best seller. 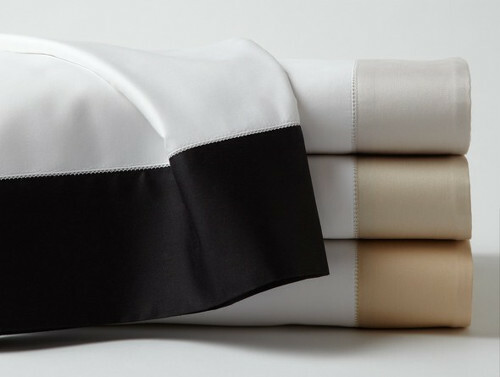 The Soprano Cuff duvet and sheeting collection is a 100% Egyptian cotton, 420 thread count white sheet with a colored cuff and a single-row hemstitch on the hem. Available in a Black, Gold, Linen or Platinum cuff, the Soprano Cuff is imported from Portugal. 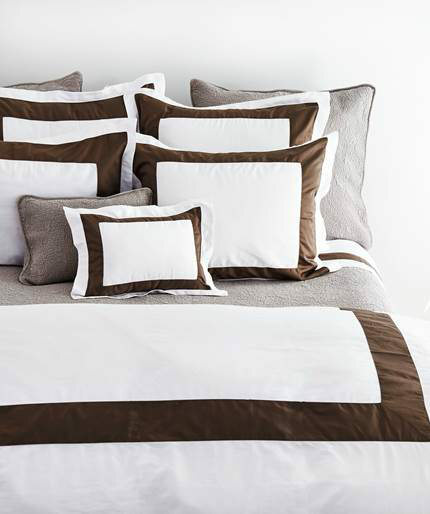 The collection includes duvet cover, flat sheet, fitted sheet, pillowcases, shams, and decorative pillow. Available at DefiningElegance.com. The Cassia bedding collection from Traditions Linens features a color palette of white, linen, and gray. The linen application on Italian percale duvet and sheeting gives this ensemble a crisp clean look. Cassia makes a wonderful companion to a stone washed Louisa coverlet and shams and for a stunningly modern appeal. The Preston duvet and sheet set from Traditions Linens is a 320 thread count cotton sateen with an inset contrast sateen band and hemstitch detail. Modern and sleek, the collection includes a duvet cover, shams, and a sheet set, which can be coordinated with the Couture matelassé coverlet and shams to complete the ensemble.